If you somehow hibernated through the unseasonably warm Hollywood awards season, you might not know Bradley Cooper and Lady Gaga recently starred alongside each other in A Star Is Born. The modern take on an old tale saw the talented individuals play love interests in one of the greatest – and most devastating – romances ever told. So, inevitably, people who don’t understand the difference between reality and fiction have convinced themselves the acting was too good not to be true. Gaga and Cooper have been hitting the promo circuit hard and, as one could expect from a seasoned pro who once wore a dress made out of meat and a trained thespian, the off-screen performances have been as outstanding as those delivered in the film. What’s nice is, for once, the companionship the colleagues clearly developed on set seems sincere. But, God forbid a man and a woman ever just be pals; people can’t help themselves but suggest there’s something more to the friendship. The Paparazzi singer has finally put paid to them once and for all. 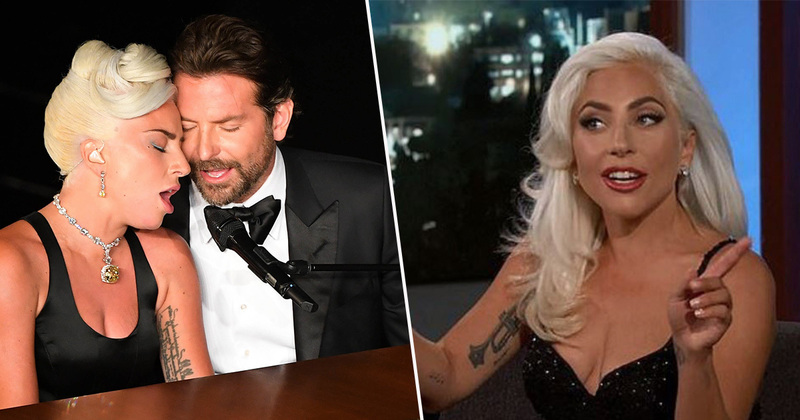 The superstar, 32, scoffed at the suggestion during an appearance on Jimmy Kimmel’s chat show on Wednesday 27 February, as she insisted the intense performance of Shallow at the Oscars was all a ploy. Turns out – shock horror – Cooper had choreographed pretty much every performance of Shallow to date, and obviously this was no exception. That is what we wanted you to see. This is a long song. It is a love story and we worked so hard. I knew he had the vision for how it should go. The song earned Gaga her first Academy Award for Best Original Song, along with co-writers Mark Ronson, Anthony Rossomando, and Andrew Wyatt. Meanwhile, Cooper’s directorial debut could not have gone better by anyone’s standards, and the film raked in $424.4 million at the Box Office. After all, the movie-making business is just that – a business based on adoration of fans. Cooper has played it exquisitely. Even so, many gossip commentators in Hollywood and a lot of fans on social media speculated Gaga’s closeness with Cooper played into her recent split from fiancé, Christian Carino. Meanwhile, Cooper took his partner, model Irina Shayk, as his date to the Oscars. If anything, this whole showdown is simply credit to Cooper’s clever directorial talents and Gaga’s amazing chameleon-like skills.